Even though attackers use various tools to compromise a network, there are core activities that form the foundation of each malicious operation. One essential component is establishing command & control (C&C) communication between the attacker and hacked network. Detecting and blocking the attacker’s C&C attempts is a useful approach for shutting down a variety of malicious operations. DGAs have quickly become the main method attackers use to remotely communicate with the sophisticated malicious tools they’ve created. Adversaries have stopped using hard-coded domain lists and IP addresses, which are useless once blocked. DGAs by comparison are easy to implement, difficult to block, and may be impossible to predict in advance and can be quickly modified if the previously used algorithm becomes known. Often, the seed is simply the current date in some standard format. The domain body generator is the main part of a DGA, and can basically be anything―a random string of characters, concatenation of random words, a constant part followed by a changing suffix, and so on. The set of TLDs, however, must contain real-world values that determine under which Web entities the generated domains are registered. Even when a certain DGA is known (for example, by reverse engineering a malware sample), it’s still difficult―or even impossible―to effectively block it. First, there is the sheer number of possible domains that can be generated. Gameover Zeus, for example, generates 1,000 domains every day. This amounts to 365,000 domains that need to be generated in advance and blocked, which would strain on firewalls and other network-filtering solutions. And that’s just for one, single DGA for a year. While the amount of domains that need to be blocked is problematic and some registrars are very uncooperative with law enforcement agencies, the seed can be the real issue. The date can be predicted indefinitely, but it’s not the only value that can constantly change. The DGA can use, for example, the daily trending hashtag on Twitter, the current exchange rate of the U.S. dollar to the Japanese yen, the temperature in Rio de Janeiro and basically any value that can be reliably obtained via the Internet by both the malware and its operator. Predicting these values in advance is of course impossible, and most filtering solutions do not support dynamic generation of domains to block. 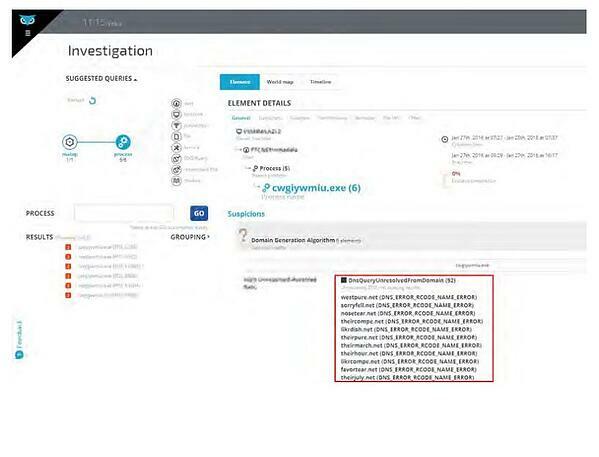 Law enforcement and government agencies from across the world, including the FBI, have attempted to take control over these domains at the source by going after the registrars, as seen in Operation Tovar. But even government organizations have limits to their power. In the case of Operation Tovar, the FBI, was unable to take over domains registered under the Russian TLD. And accessing the TLD name servers requires spending huge amounts of time and effort to obtain a warrant, which had to be renewed every six months. Some researchers have tried to detect randomly-generated domains by their patterns, without knowing the algorithm in advance, and had some moderate success. The problem with this approach is two-fold. First, there is a strong chance for false positives, as many legitimate websites use load-balancing servers and other strange looking domain names, and the tiny ratio of DGA traffic compared to regular traffic makes false positives almost a certainty. Secondly, DGA body generators can take many forms and aren’t necessarily a long string of random characters (see the following examples, detected in Cybereason customer environments). These domains can't be detected using traditional security methods. 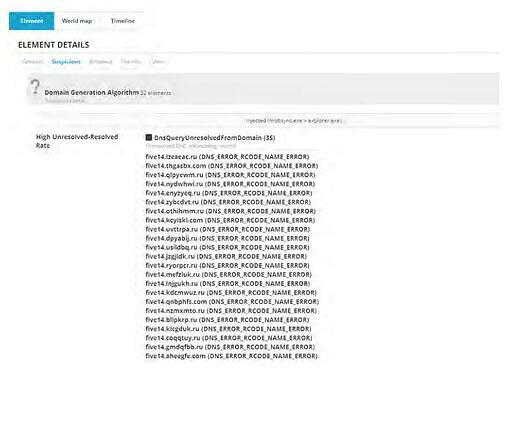 The Cybereason platform uses a unique approach for DGA detection, looking for behaviors associated with DGAs instead of looking for DGA variants. Using this approach, Cybereason Labs has identified new DGA variants in customer environments. We hereby describe these variants and the outcome of our investigation. A Russian malware using an unknown DGA. Mechanism of Action Each day, 35 domains are generated by randomly selecting seven letters, suffixing them with either the .ru or the .com top-level domains and prefixing them with the word “five” followed by a number. This is unusual, since most DGAs do not bother with any subdomain, and perhaps this is why it’s done in this case, to give some semblance of legitimacy. 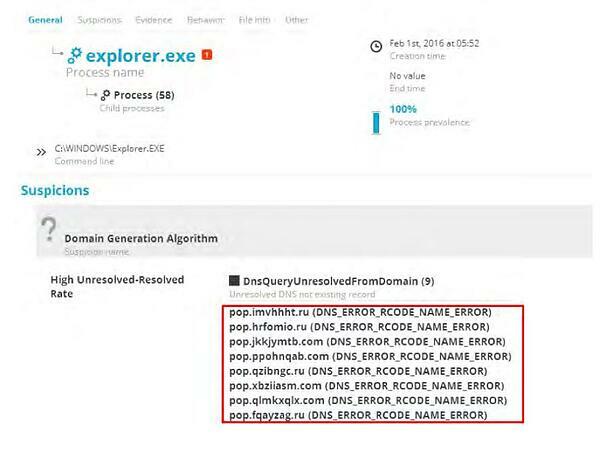 The malicious code usually injects itself into explorer.exe to evade detection. Another very similar variant was detected on another machine in the same organization, but in this case only nine domains are generated, and the prefix is the constant word “pop”: see the screenshot below. This seems to be the same DGA as an unnamed malware analyzed by Crowdstrike in 2013. Mechanism of Action Domains are generated by randomly choosing two English words from a hard-coded list and concatenating them together under the .net top-level domain. With a list of 384 (0x180) words, this comes to approximately 150,000 possible combinations. The difficulty of detecting this simple algorithm is that the domains do not seem to be randomly generated, and the commonly used words may appear in many legitimate domain names. However, it seems that this malware may use several different word lists. By simply replacing this list, the attackers can completely evade detection of the old algorithm. This includes words such as “july,” “table,” “city,” “favor,” “dish” and others. A nasty backdoor malware. Mechanism of Action Randomly-generated strings of eight to 20 characters in length suffixed with one of the many multiple exotic top-level-domains, such as .ga (Gabon), .im (Isle of Man) and .sc (Seychelles). This makes it harder for law enforcement agencies to take down these domains. Dridex is a strain of banking malware that leverages macros in Microsoft Office to infect systems. What does it do? 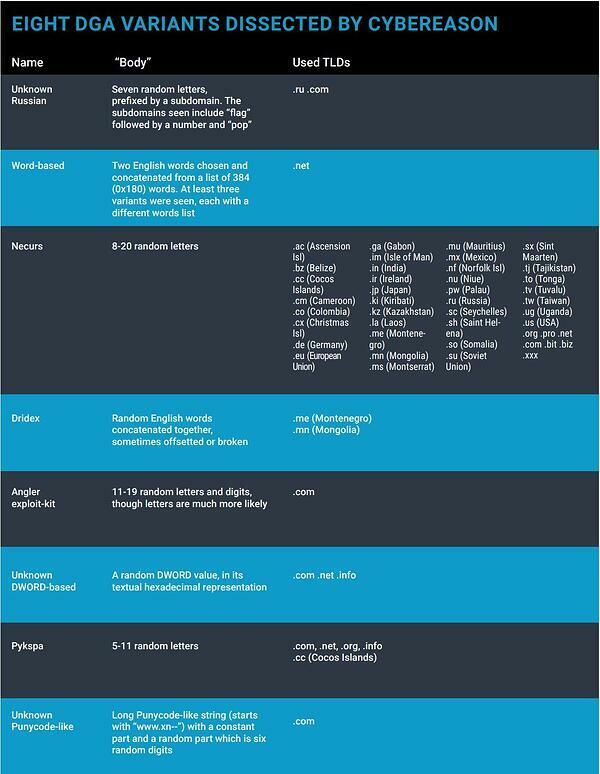 Concatenates English words and parts of words chosen in random from a small list, suffixed by the .mn (Mongolia) and .me (Montenegro) top-level domains. Unlike the malware described by Crowdstrike, in this variant the words are often broken, shifted and padded with random characters, significantly increasing the number of possible combinations and making detection much harder. A widely used exploit kit. While the domains generated by this DGA were previously connected to the Angler exploit kit, they do not appear to be generated by the known DGA, and may be a new variant. The algorithms strings randomly chosen characters and digits under the .com top-level domain. Unknown malware injected inside svchost.exe. The DGA of this malware seems to generate a random DWORD (a 32-bit integer, with a maximum value of approximately 4 million) then converts it to its hexadecimal format and suffix the result with either the .com, .net or .info TLDs. This DGA has not been disclosed before online, making it unique. This appears to be the first time this DGA has been discussed, making it a new discovery. A stealthy botnet that uses Skype. Mechanism of Action Randomly generated strings of characters of varying lengths suffixed with the .com, .net, .org, .info and .cc (Cocos Islands) top-level domains. Unknown malware that generates domains that look like Punycode―non-English domain names―but are, in fact, randomly-generated gibberish.